File photo of Gov. Asa Hutchinson on March 6, 2017 detailing proposed changes to the state's Medicaid expansion program. One of the changes included implementation of a work requirement for recipients which a federal judge tossed out last month. The Trump administration is appealing recent rulings by a federal judge that blocked work requirements for some low-income people on Medicaid. 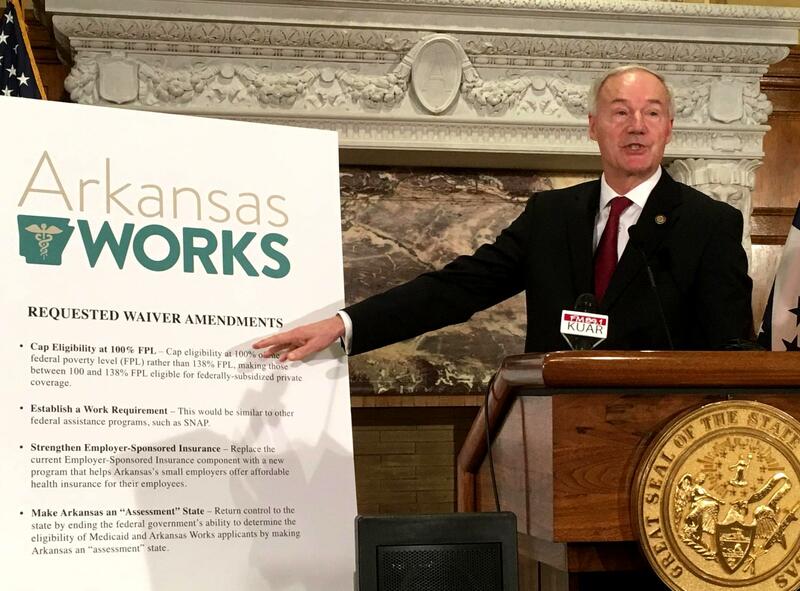 Arkansas was the first state in the nation to be granted a waiver by the federal government to impose a work requirement on those with healthcare coverage through the state’s Medicaid expansion. With Wednesday’s ruling by U.S. District Judge James E. Boasberg which halted the requirement, Arkansas leaders have been reacting on nationally-heard NPR programs. The judge said the requirement undermines the very purpose of Medicaid which is to give medical care to low-income people . Gov. Asa Hutchinson is urging the Trump administration to pursue an expedited appeal of a U.S. district judge’s decision nullifying the Arkansas Works work requirement, while the Speaker of the House expects that body to vote in favor of funding the agency that administers the program on Friday. The news came at a press conference Wednesday led by Hutchinson along with Speaker Matthew Shepherd, R-El Dorado, and Senate President Pro Tempore Jim Hendren, R-Sulphur Springs. A federal judge has ruled that work requirements under the Arkansas Works program are not legal and called for an immediate halt to that element of the program. The ruling could have significant budget implications for the state. In a ruling issued late Wednesday, U.S. Federal Judge James Boasberg said the work requirement element applied in 2018 to Arkansas’ Medicaid system is not legal. He rejected claims by the state that striking down the provision would be disruptive.